So one late night, unable to sleep, I grabbed my phone (like one does when they can’t sleep) and started scrolling through YouTube. I came across a video recipe from one of my video chef heroes, Chef John of Food Wishes, and was immediately entranced with his version of Pasteis De Nata or Portuguese custard tarts. Today… I made my own. Now mine is very similar to Chef John’s recipe. I added an ingredient or two and changed a method of preparation, but they are basically the same. The video is included below, and Chef John can explain the tarts to you better than I could. Crunchy outer crust, smooth and creamy custard filling loaded with a lot of delicious flavors. Try it out for yourself, and be sure to check out more of Chef John and Food Wishes the next time you can’t sleep! Learn how to make Portuguese Custard Tarts (Pasteis de Nata)! If there were a Hall of Fame for tarts, these would have an entire wing. They truly are a unique, and mind-blowingly delicious sweet treat. Plus, they were invented by hermit monks, which make them even cooler. *depending on what's going on outside weather-wise (and yes it matters) you may need to adjust flour and water. You’re looking for wet sticky dough. Combine the flour and salt in a mixing bowl and give it a good stir. Add the cold water and stir to a wet sticky dough. Remove the mixture to a floured surface and knead until slightly less sticky and manageable. Cover and allow it to rest 15 minutes. Lightly re-flour the surface and roll the dough out to a thin rectangle about 1/8” thickness. It may be a little frustrating to work with but just get through it.. its well worth it when it comes to the crunchy tart shell at the end. Butter 2/3 of the rectangle. Fold in one side halfway over, followed by the other side, creating “letter fold.” Almost like lamenting puff pastry dough. Even up the sides making sure it’s all uniform. Pop the dough in the fridge 10 minutes to relax and firm the butter up a bit. Remove the dough and repeat the process two more times or until you have used all the butter. Roll the dough out into one final rectangle. Cover in cinnamon and lightly rub in. This will make sense later, if not for the delicious added flavor. Roll the dough up, starting with short end, as you would cinnamon rolls. Once you have a nice roll, wrap it loosely in parchment paper and place in the fridge to firm up. You will be slicing this in a bit. Place everything in a pot and bring to simmer. Cook for 15 minutes or until syrup consistency. Remove from the heat and set aside. 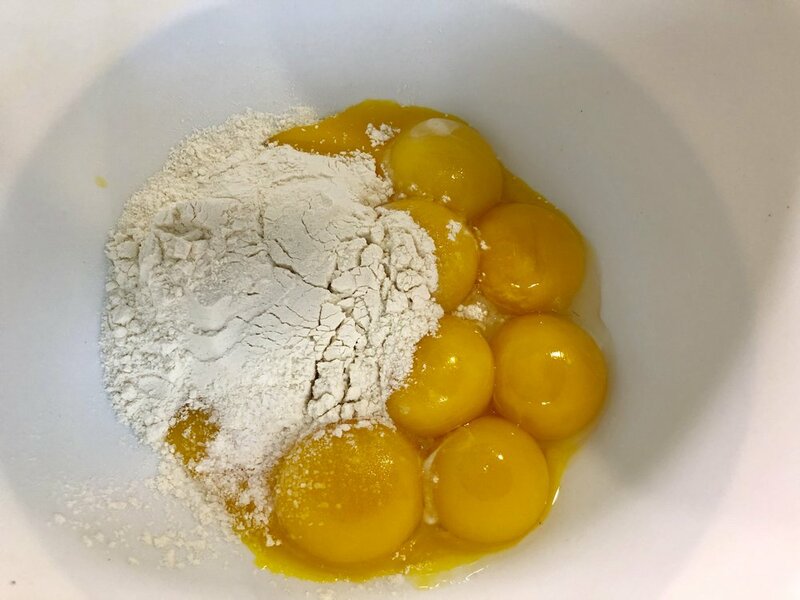 In a large mixing bowl add the egg yolks along with the flour and Kosher salt. Mix smoothly to a paste. Scald the milk in a pot on your stove just until it starts to steam. Temper the milk into the egg yolk mixture whisking all the while until the bowl has warmed. Add in the remains milk at once and mix until smooth. Add the vanilla. Pour in the syrup mixture including the lemon peel and spices. Give it a good mix. Pour the custard through a strainer into a large liquid measuring cup (or small pitcher) to collect the spices and any lumps and curds that formed along the way. Preheat your oven to 500 degrees. You will need a cupcake or muffin pan. I opened for the slightly larger cupcake/muffin pan for my tarts. Remove the dough from your refrigerator. Slice the dough into 1-1 1/2” pieces. Towards the large end if using muffin pans for your tarts. The idea is to stand the rolled pieces up, pinwheel facing up, then press down to make the base of your tart. From there, with your fingers, work/press the dough up along the sides. After your tarts are baked, you will be able to see the “cinnamon roll pinwheel” on the bottom of your tarts. Get it? 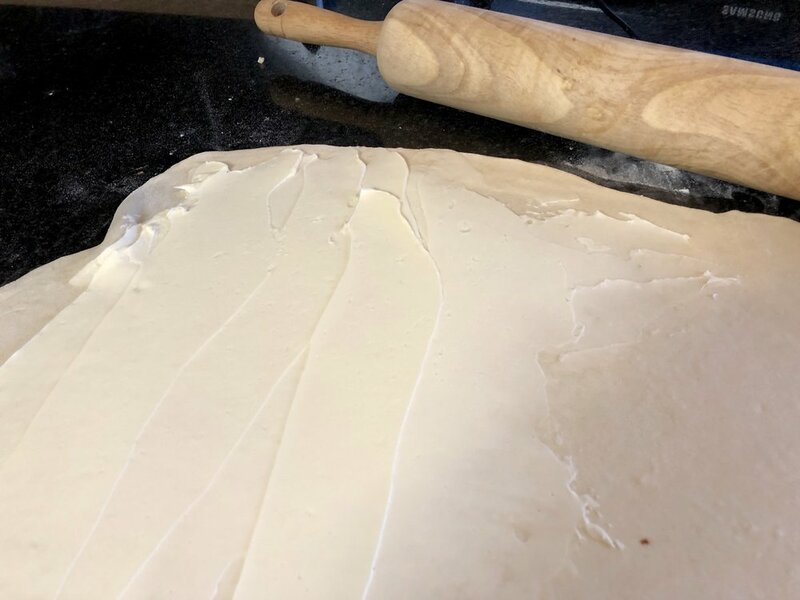 Once the dough has been pressed into the pans, our in your custard mixture not quite all the way up to the top of your dough. Fill each one evenly full as the last. Remove the tarts to a platter and allow to cool thoroughly. Remember they may feel slightly warm on the outside but will be very hot on the inside. Cool completely, so the custard has time to set. Dust the tops with powdered sugar if desired. Enjoy! This was slightly warm when I cut it because I couldn’t wait, but notice the dip in the center. well worth it though!